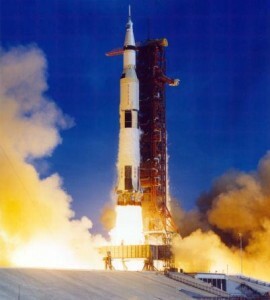 SciFund outreach class: go for launch! The first SciFund Challenge outreach training class for scientists launches in a week and we are very excited! Apparently, we aren’t the only ones. When we were planning this class, we were hoping that 50 scientists might be interested in participating. Well, were we wrong. When we opened registration for the class, 171 scientists signed up in less than six days and we had to close registration weeks early. If you missed the registration window, not to worry! We’ll be running more of these internet-based outreach training classes in the months to come. Sign up for our mailing list to stay in the loop. And everyone is welcome to follow along on the blog, where most class materials will be posted. Consider this the first update on the class, with many more to come over the next month. 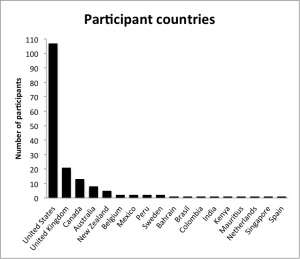 So, who are the 171 participants in our inaugural outreach class? Well, we know quite a few things about them from the application forms. They hail from all over the world, as you can see on this handy map. The majority are in the United States, but 18 countries are represented. 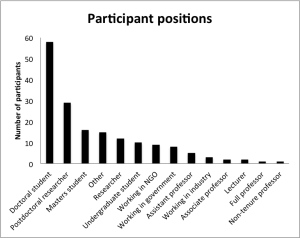 The vast majority of the participants are in academia (no big surprise), with more than half being graduate students or postdocs. Most of the folks involved in the class are biology types, with a strong emphasis on ecology/zoology/conservation kinds of things. This isn’t surprising, as we had only just begun with our promotion campaign about the class, when we got flooded with people and had to stop early. We had started getting the word out with primarily ecology-related circles of people, hence the disciplines represented. Previous Call for short videos on outreach experiences!